is less than one week away, and we now have sold out our venue in San Francisco and our watch event in New York City. We still want you to be able to join us for the fun and news - including our keynote and breakout session- so we have a livestream set up so you can pick the sessions you want to join and will be live-tweeting the entire event. Make sure to catch us on Twitter and Google+ using #GCPLive to hear updates as they’re announced and to talk to us directly. Can’t wait to see you all in San Francisco, New York City, or on social media. 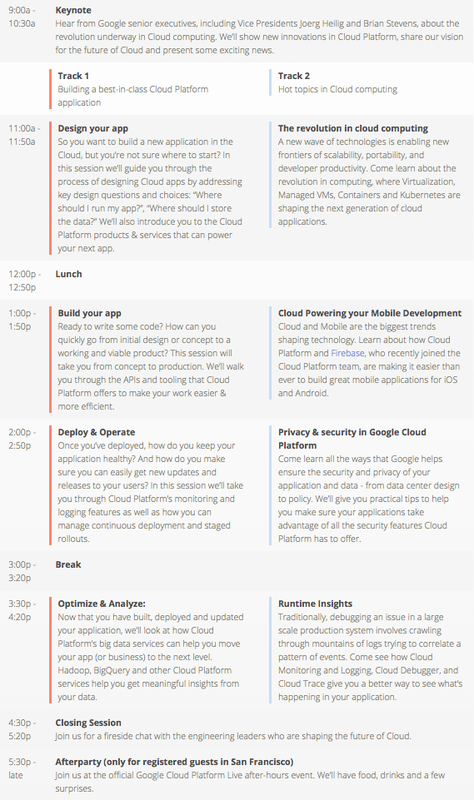 Google Cloud Platform Live is less than one week away, and we now have sold out our venue in San Francisco and our watch event in New York City.